Gwendolyn’s enthusiasm was echoed by the more than 100 students and teachers at Capital City Public Charter School who had the opportunity to hear from 1968 Olympic icon and political activist John Carlos and sportswriter Dave Zirin on Oct. 3, 2011. 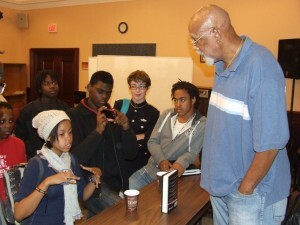 As part of the national book tour to launch The John Carlos Story (Haymarket Books, 2011), Carlos and Zirin spoke to the students about that moment in history, the limited explanations given in textbooks, and its continued significance. Dave Zirin began the 60-minute session at the school with a description of the demands made by the Olympic Project for Human Rights, the symbolism of the photo, and the threats faced by John Carlos and Tommie Smith during and after the Olympics due to the stand they took. 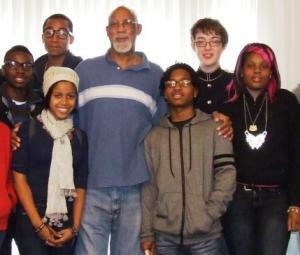 John Carlos followed with stories from his life and encouraged students to learn the true history of the United States and the world. Here is a link to a video clip of Gwendolyn, quoted at the top of this page. More student reflections on the presentation: Tiffany and Raymond. This school visit was coordinated by 11th-grade U.S. history teacher Julian Hipkins III, Dave Zirin of Edge of Sports, Teaching for Change, and the Zinn Education Project. A full tape of the presentations and Q&A can be seen here: Part 1 and Part 2. 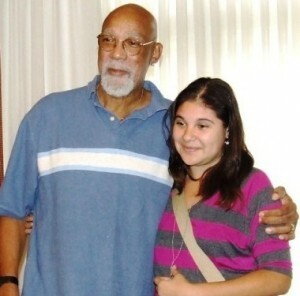 For more information about the book and national tour, visit: The John Carlos Story. Thanks to intern Jozi T. Zwerdling for the transcription.